Posted on March 29th, 2016 in Events. No Comments. I’ve got a few projects and events I want to share with you. Last fall I debuted a new interactive installation called Audiograph, which translates sound into light in the form of a clock (pictured above at Art in Odd Places 2015: TONE). You can read more about it and see it in action here, and I’ll be showing it again this Saturday at the UCF Art Gallery in Orlando, as part of the SURFACES exhibition. Later in April I’ll be headed to Waterloo, Ontario for the debut performance of a new work for orchestra composed by my friend Dmitri Tymoczko. 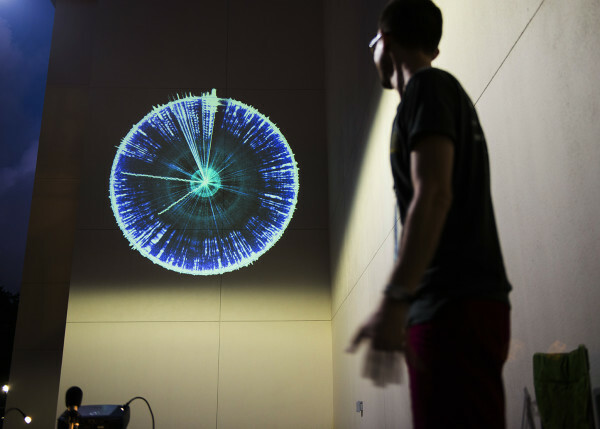 We were just up in Waterloo a few weeks ago talking about the connections between mathematics, music, and visual art – and the process of collaboration for this piece. If you’re near Toronto, there are still some tickets available here. I’ll be performing real-time live visuals for the piece. The first week of May I’ll be in NYC for Creative Tech Week, a new meta-conference which is the brainchild of Isabel Draves, host of the LISA (Leaders in Software and Art) meetup. There are a ton of exciting talks, exhibitions and events associated with this. If you are interested in attending the whole week, please use my discount code NathanSelikoff for 30% off (through March 31st) and register here. My contribution will be a 15 minute free talk on Thursday, May 5th at 12pm – details here.